John earned his Doctorate degree in Physical Therapy and his Bachelors of Science degree in Rehabilitation Therapy, both from Northeastern University. 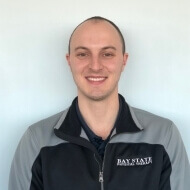 During his studies, John interned at dynamic clinics in Palm Beach Gardens,FL and at BSPT Danvers with a focus in outpatient orthopedic rehabilitation. John also brings a medical background to his out-patient practice from an internship he completed at a skilled nursing facility in Alabama in 2011. In addition to his Physical Therapy degree, John is a Certified Strength and Conditioning Specialist. He enjoys working with his patients to develop treatment plans to ensure they have the knowledge to continue to improve their overall health and fitness. His rehab goals focus on working hand in hand with his patients to return them to their prior level of function by using manual therapy, functional exercise, and patient education. Originally from Arlington,MA, John was a three sport varsity athlete in baseball, basketball and golf. He continues to enjoy these sports both as player and a spectator.